Neatly fold your quilt top and backing fabric (if providing your own). Place them in a bag, such as a kitchen bag, for added protection. Please make sure any provided backing fabric is at least 10″ larger per dimension than the quilt top (ex: for a 70×75 quilt top, backing should be 80×85). Package securely in a box. Include your name and contact info on a piece of paper inside. 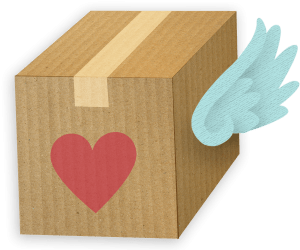 Use a sturdy box that was meant for shipping. Try not to leave any empty air in your box. This causes a weakness that can result in tearing and collapsing. If your box is too big, use some spare shipping materials to fill it up, or cut the box down along the top corners so that the flaps lay down right on top of your shirts. Tape down all open edges of the box top and bottom. You should be able to kick the box and drop something heavy on it without hurting anything. You can drop your order off at our Louisville location and save on shipping! Please use the button below to set up an appointment. We’ll keep you in the loop and let you know when it has safely arrived. And, of course, you are always free to contact us at any stage of the process! You can quickly price-check the shipping carriers with ShipGooder.